If there's Indian meatballs, there must be Chinese meatballs right? Maybe not the same. Not dark mutton meatballs (Indian Mutton Meatball Soup), but rather white faded Chinese chicken meatballs? Oh Dear Me! What have I said? Then again, its the truth anyway. Mutton is dark in color, whereas chicken? Alright. Enough of meatball stories, let's make this Chinese Chicken Meatball Soup (Bee Hoon Soup, Chinese Black Vinegar Chicken & Chick Kut Teh). 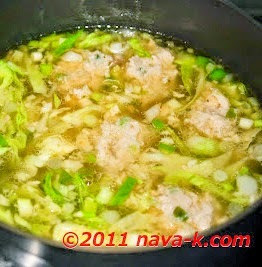 Meatballs which will float up in the soup once cooked and cabbage, and spring onion wondrously flavourful soup. Into minced chicken, add 3/4 of the sliced spring onion, cornflour, black pepper powder, light soy sauce, ginger and salt. Mix all together and keep aside. Heat oil and when heated. fry garlic and 1 tbsp of the minced chicken for about 2 to 3 mins. Add water, chicken granules and season with salt. 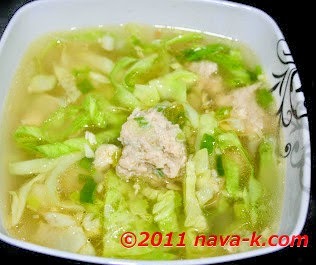 Drop, spoon the prepared minced chicken, in equal portion inside and cook until they float. Off the heat, and combine in cabbage and spring onion.